When it comes to eating in my Healthy Kitchen, for at least one meal a day – lunch or dinner – the salad is always in the spotlight. It’s the main dish. And when I finish making my salad, it always looks like I should share it with someone. It’s HUGE – but I don’t share it because it’s all for me! Every bite! Best of all I never feel guilty when I eat every morsel on my plate. I never count my calories. I never feel unsatisfied or hungry within 30 minutes of eating my meal. They’re always beautiful – made from fresh, colorful, and snappy ingredients that are from every color in the rainbow. They’re always delicious because I truly believe that you should only eat foods that you love. 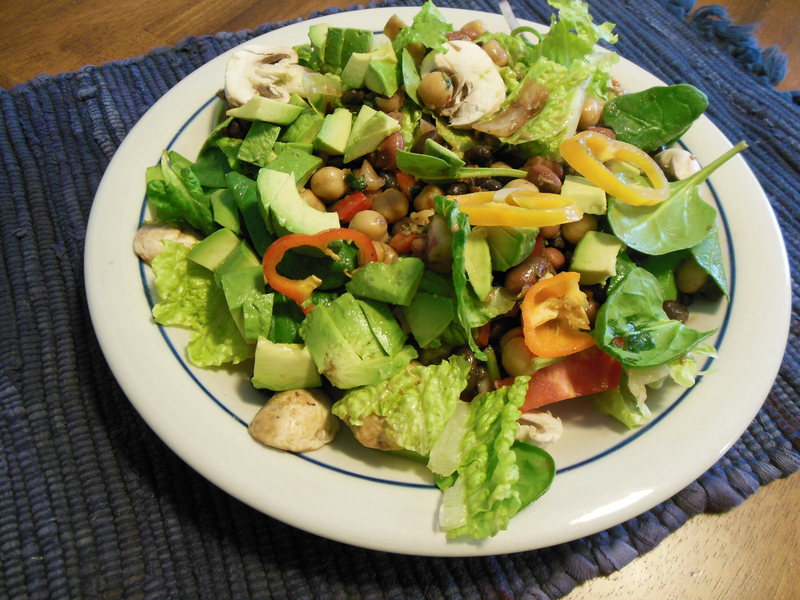 The best thing about salads is that they can be made ahead, and they are super quick to prepare. They keep well in your fridge, and they are easy to take along with you to work or school – which is not only healthier for your body, it’s healthier for your pocketbook! Next to soups, salads are one of the most creative of recipes. You are only limited by the available ingredients in your fridge, your taste at that moment, and of course your imagination. Go wild! 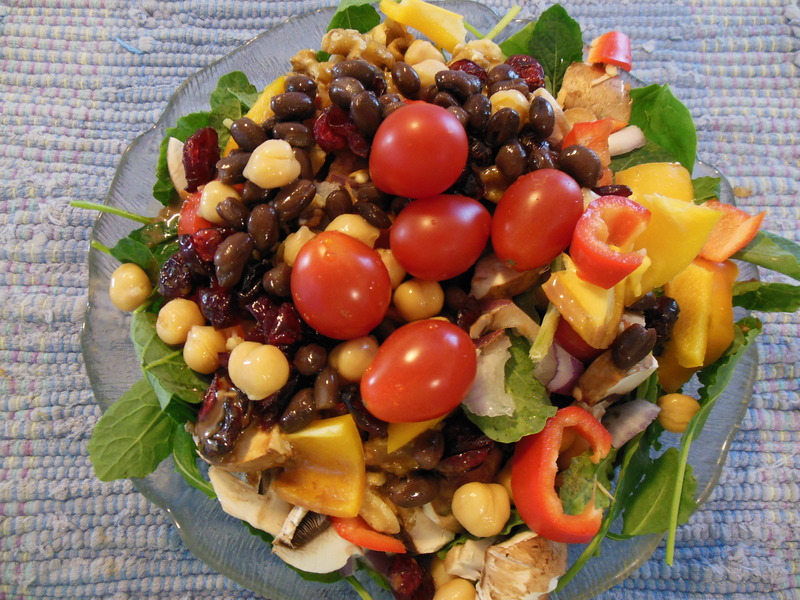 So here is one of my favorite salad recipes that I call Center Stage Romain and Spinach Salad because the recipe showcases a bounty of beautiful color, crunch and snap. But please, remember, if you don’t particularly like something in this list, feel free to replace it with something you love. Or if you’ve run out of spinach but have some fresh kale use that instead. The key is to use fresh, whole veggies that are nutritious and delicious. Go wild, be creative and enjoy what you eat! Place the first 12 ingredients on a full-size dinner plate (at least 12” in diameter). 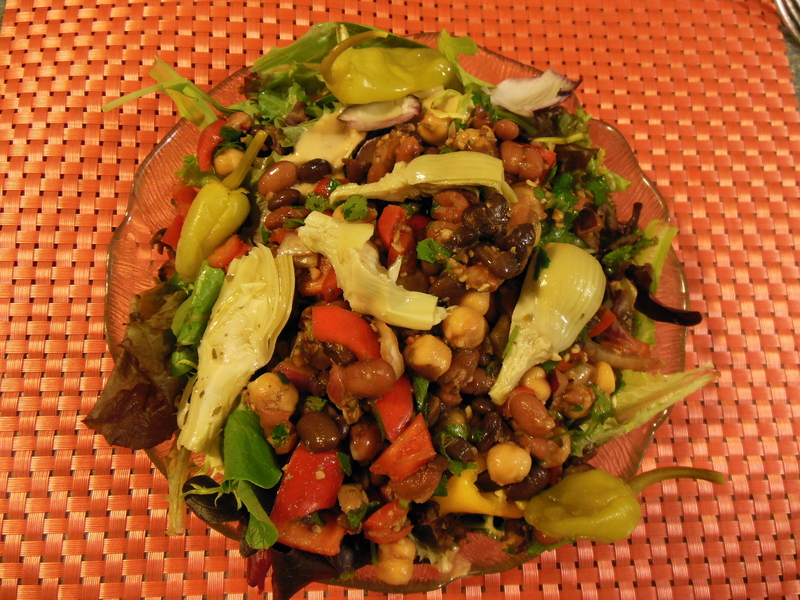 Seriously, the veggies in this salad will weigh close to 1 pound and that’s without the beans! Sprinkle on your choice of beans. 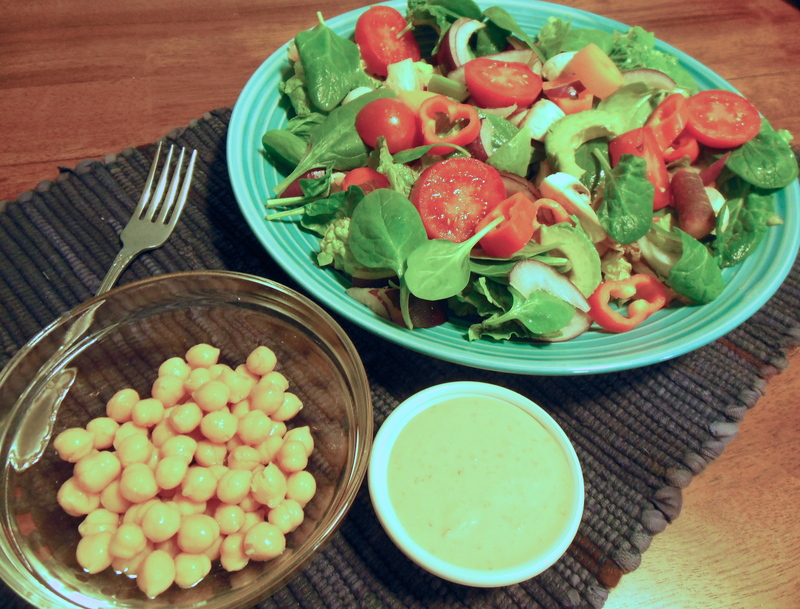 Drizzle with your favorite dressing; such as a stone-ground mustard, garlic champagne vinaigrette, or a garlic and balsamic vinaigrette, or Annie’s Naturals Goddess dressing (I love it’s zip from the nutritional yeast) or a simple chunky salsa. Remember, go wild! Here are some of my other variations. This one is with organic black beans, cherry tomatoes, and I sprinkled on a few craisens. 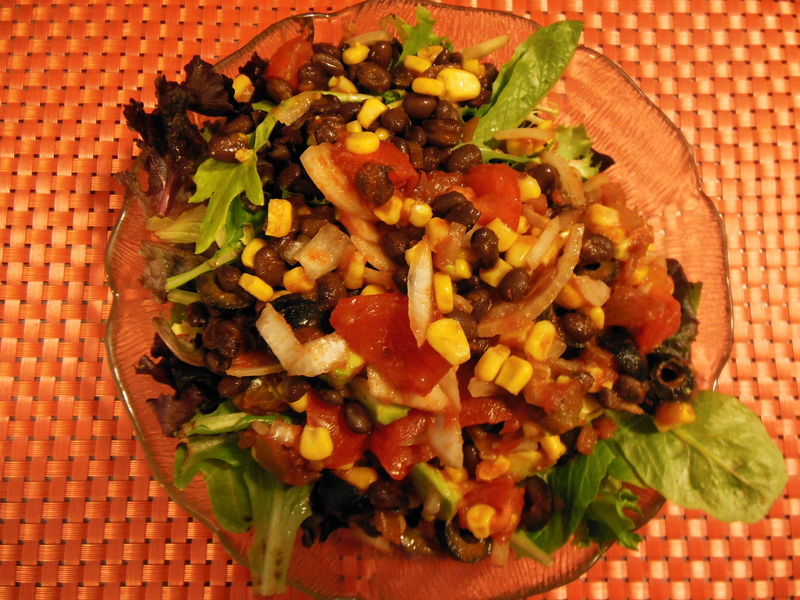 On this salad, I’ve used kale with my spinach and a spring mix of lettuce along with about 1/4 cup of corn, 3 sliced black olives, sliced sweet white onions, black beans and a chunky salsa for dressing! And on this day, I ran out of tomatoes, so I added a few more mushrooms and used sliced sweet white onions, and a mixture of 1/4 cup garbanzo and 1/4 cup black beans. Here I’ve added some quarters of marinated artichoke hearts and a three-bean mix marinated with balsamic vinegar and I tossed on a few whole peperoncini. Seriously, how can you go wrong?